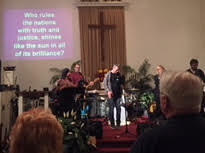 Members of the Colonial Church of Bayside in Queens, NY, and the surrounding community came together on Saturday, October 12th to enjoy a wonderful free concert of classic rock and praise, led by local rock/soul cover band The Brothers & Sisters Kilborne. They enjoyed listening (and moving!) to some of the greatest hits from the 70’s and 80’s, followed by a powerful time of worship as they joined in singing well-loved songs of praise. This was made possible by a generous grant from the Regional Synod of New York, with the goal of attracting fans of the band to the church, sharing about their ministries, and inviting them to worship. All are invited to a Christmas Concert with the band, the Colonial Christmas Choir, and talented special guests, on Thursday, December 13th at 8 pm. Colonial Church of Bayside, 54-02 217 St. Bayside, NY 11364.